john4jack (Corvallis, Oregon, United States) on 14 March 2010 in Transportation and Portfolio. Continuing my brief hiatus from flower photographs, I went back and did some B&W conversions from our Sumpter train trip last October. metals and details of the train versus the soft flowing puff of the steam !! Fabulous! We are in past times with this picture. Very good moment with these clouds of steam. The b/w is fantastic, as the details are. I love this wonderful photograph! Impressive! A perfect steam engine powerful moves. The splendid smoke rises into the sky for sure! But in addition to a dense smoke is spread on both sides of the machine! A perfect diagonal rails with vanishing points perfectly drawn. The W/B a delight! A perfect image for Sunday dear friend! Thanks and many kisses Jack! Nice F/8.0 shot. I like the details. Excellente composition. Le rendu de la fumée est spectaculaire, le choix du nb une très bonne idée. Bon dimanche Jack ! comme sorti du siecle dernier ! Superb hiatus ! Love this smoke & elegance ! Have a good & rich sabbatical time, i post a little less too to take more time elsewhere (shooting included ! ), see you my dear Jack ! A spectacular B&W rendering... an excellent photo, love it !! Hope all is good for you and your familly... and hope to see you back soon, i'll miss you. Take care Jack !! 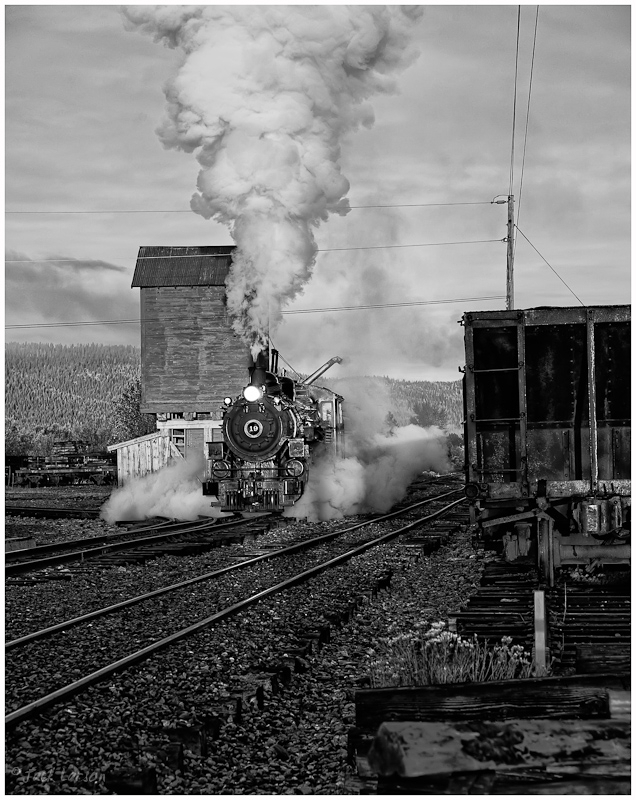 I like the B&W shot of this locomotive and the steam. Excellent compo. Excellent capture Jack. Great B&W processing and beautiful contrasting elements. Great work. GReat conversion Jack.....splendid image...smokestack pouring is the perfect touch!!! A fine viewpoint and wonderful timing to get this locomotive at the prime moment. Excellent processing. I especially like the gradation in the steam/smoke. Wow. Take my breath away. What a range of grays. This is masterful. Oh, I love this image! Takes my breath away. Have a good hiatus. Blessings and all good things to you. Perfect B&W ! I like the smoke ! Amazing shot (capture and processing). Ooh that smoke is perfectly dramatic, great processing. This is truly spectacular Jack! Not only the composition, the detail and clarity, the movement, but the setting too. Great use of contrast and a dynamite subject matter! as the time farwest, jack, belle image! This is great in black and white and it makes one think it is a very old photograph. The smooth sky and steam against the coarseness of the ground is so effective. This is an excellent b&w! very well done ! I like the clarity and sharpness on this image! The black and white is perfect with the steam coming up from the train! Great work on this! This is one sharp and clear and doing extremely well in B&W! WEll done indeed! l'atmosphère est magnifique, superbe scène noir et blanc. Fantastic b&w...and i love trains..beautiful work..